A trailer about the game and its components. 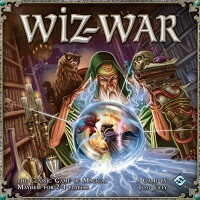 Wiz-War takes place in a stone dungeon, where 2-4 players (Wizards) battle to earn Victory Points. 1. Capture get another player’s treasure token onto your starting space. There are 7 schools of magic, White Cantrip, Alchemy, Conjuring, Elemental, Mentalism, Mutation, and Thaumaturgy. During the setup of each game the players choose the White Cantrip school, and 3 other schools of magic to play with. The unselected schools of magic go back into the box and won’t be used this game. This selection of magic schools really helps replayability as the schools interact differently with each other, making each game unique. 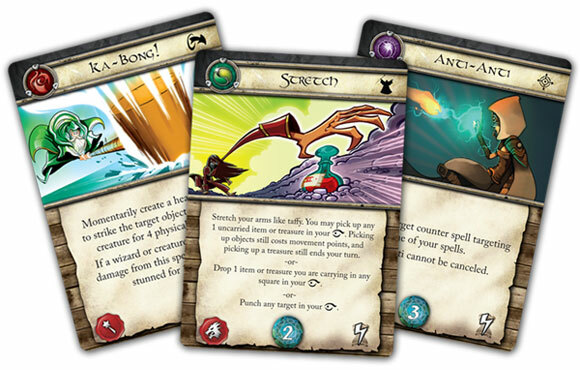 Each Wizard starts the game with 15 health points and a hand of 7 cards, drawn out of the spell deck. On your turn you may move 3 spaces (or more if modified), cast any number of “general” spells, and make 1 attack OR cast 1 harmful spell. The spells you choose to use, and how you choose to use them, are the main deciding factor of who will win. Luck is a factor in this game, but not as much of a factor as most games I’ve played. Most attacks are flat rate, or variable based on the energy that you choose to pump into a card, and the few things that require a die roll use a 4 sided die. The one and only downside that I saw about this game is that if a Wizard loses all of his/her hit points, or if both their treasures are on other player’s starting areas, he/she is eliminated and does not continue playing the game. This wasn’t a problem in any of the games I’ve played, but I could see it being a problem if one player gets teamed up on and gets eliminated early. My gaming group and I really enjoy this game because of the challenge of trying to use your spells in the most strategic way possible to get to survive, protect your treasure, and steal your opponent’s treasue. I would highly recommend this game to anyone that likes the idea of fantasy battles. I used to play the old-school version of Wiz-War. I recall bashing and zapping my friends’ wizards and running around grabbing their treasures while defending my own. I’m sure I played it over 30 times, back in the day. Last night, I opened the new Fantasy Flight version. I can’t say enough positive things about the component quality. And quantity. I don’t remember there being so many parts. The game comes with a few zip-lock bags, but you’ll want to get more to speed the setup. The art is clear, colorful and appropriate. The sculpted figures are interesting and well-cast enough to use as character figures in a roleplaying game. My only complaint about the components are the warp doors, and this is pretty minor. 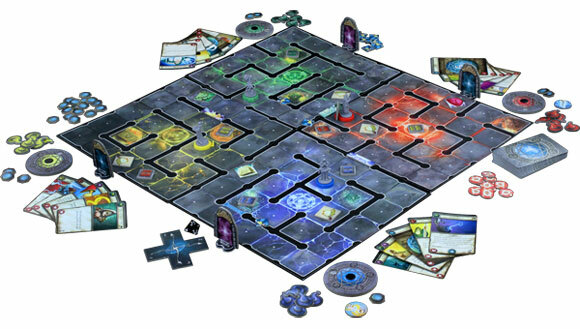 There are two sets of matched doors which act as warp portals, taking you to the other side of the board. Two of the doors are blue and two are purple. For those of us who are colorblind, all four are identical. To be fair, there are tiny symbols above each door which differentiate them as well, but these are too subtle to be of much help. There are more rules than this game probably needs. At 20 pages, I’d say the rules are about twice as long as they aught to be. Rules are repeated in several places, not because the editors weren’t careful, but because they seemed to want to present them in context throughout. The bigger problem is that they front load wordy descriptions of every component, which results in the actual rules of play not beginning until page 6. The additional rules begin on page 14 (!?!). All those rules and components, but for some reason, there are no turn summary cards. The turns are not horribly complicated, but a reminder card would certainly help beginning players. The game play is pretty much as I remember. A lot of bashing and zapping. I guess I’ve played so many other boardgames in the gap between the original and this version, I’ve come to expect a bit more. One of the big problems with Wiz-War is that players can be eliminated. In a four player game, that could happen quickly to one player. I liken Wiz-War to Frag in most respects, and Frag handles this better. There, player’s respawn. The box lists the playing time as 30-60 minutes. That’s a big enough window, but we find that it’s actually more like 15-75. Not a good thing in a lighter game. I was really hoping to give a more positive review of the game. I’m nostalgic about it, and hoped I’d pass the enjoyment of the game on to my kids. I just feel crestfallen that my boys (12 and 16) gave it a resounding… meh. I just got Wiz War in the mail the other day and had a chance to run it through a couple of games. It really is a fantastic game, I think. It offers a lot of game play value, thinking, decent strategy and effects that can be a lot of fun. In Wiz War, you are a wizard who is trying to either steal your opponents treasure or to kill the other wizard. You do this by moving around a maze-like dungeon, playing spells and just using your magic for fun trickery. Players will select at the start of the game 4 different magic schools. You will then use the cards from those schools of magic in a deck that you will draw from. The basic idea of the game is really quick and easy to understand, and if it was just that then I think the game would have suffered – but the variety of card effects you see within the game is flat out amazing. Let’s start with the components. The box is a reasonable size for a board game – its neither too big or too small, but rather just right. The inside of the box seems to be your standard FFG flavor – from the inside construction to the cards being in ziplocked bags and a HUGE selection of tokens to punch out. The game boards are rather well constructed and have an eye catching design. The plastic sculpts for the game are really pretty good. Will the win an award for design? No, probably not – but the sculpt design is pretty good, especially for the transformation figures. The tokens are also pretty good and have a good image to them, just think there are too many of them. The best part of them, however, I think are the cards. The cards are very pretty, the art on them is very well put together. I love the art, which is a bit cartoony in its approach. Also, the card stock on the cards is pretty good too. Gameplay wise, the game is very simple. Players of all ages can pick up the basics of the game quickly and easily through one discussion of the rules before hand and a play through or two. My wife was able to pick up the basics of the game rather quickly as we were playing through it, and was able to do pretty good once she had the feel for how it plays out. The cards work out beautifully with the game, adding variety of the experience and a lot of other neat things. One of the cards my wife really liked was a card that literally moved the board around a certain amount of degrees. Seeing how it was my board that moved, I can honestly say that it made me a bit dizzy and disoriented when it happened – it was great. The flavor of the cards also adds for some interesting encounters and experiences too. With that said, I have to say that I really like the game – and can see it coming out on the table pretty often. Is it my favorite game? No, not really – but its still a really good game and I think definitely a good addition to my collection. Who would like this game? If you enjoy magic and wizards and such then this should be a no brainer I think. The game play offers some puzzle situations in the way you move, so if you enjoy a little bit more thinking to a rather light game then its a good choice as well. Its also a light enough game where younger players would be able to get into it fairly easily, so if you want to play a game with your children then this could be a decent choice too. Who would I not recommend it to? If you don’t enjoy a cartoony art style, then you will be turned off by the art of the game. The gameplay, while offering a decent amount of strategy, is still fairly light. If you enjoy intense games, then maybe you will want to try something else – but you could still find something of value here. The only problem we had was that my wife’s reading ability is not the best and the cards can, at times, have a rather HUGE wall of text – so if you have children who are still working on their reading, or just don’t want to read what a card says, then you may be a bit detracted from the game. So, my final verdict? I like it a lot. Its a great game offering solid strategy and gameplay that would please anybody. Its a game that can be played well by most age groups and interests and really is a good fit for most collections. My wife felt it was a little complex, but I think it was just due to the wall of words on the cards. Overall, I would recommend it for most people! Wow! This game is brutal and so much fun. If you enjoy enraging energy drink gulping, spell wielding nerds this is the game for you! If you enjoy petting bunnies and cuddles avoid this at all cost! This one gets personal… fast. If you play this while consuming alcohol provide plastic cups to avoid any injuries due to WizNerd gorilla anger. Wiz-War has so much going for it in that it crosses many player level paths. It provides the novice with a great starting point and gives the avid gamer enough complexity to keep it interesting. My group signals Wiz-War whenever we get together. Needless to say, my group goes for this type of game. Everyone brings their own strategy only to learn that there is always someone who dodged the radar then the focus is frantically put on that individual! Great production as always from Fantasy Flight. I never played the original version of this game but thank the lord for the internet for providing a ton of variants from the old game to keep this new version fresh by adding older rules. With a fairly easy pick-up and go set of rules this game is a breeze to teach newcomers the art of brutally frustrating friends. Wiz-War hits my table a few times a week and with hopes of expansion I see it staying there for a long while. Wiz war is one of my favourite fillers: Games are not too long, the setup is quick and is amazingly fun. Although player elimination is normally framed upon, FFG version is less lethal than previous. So although it’s a possibility, chances are all players end the game alive. The replay value is huge. Every game the layout changes, the spells change and the strategy’s are totally different. And, although luck is involved (as your spells are just drawn cards) the smart use of your resources and a well crafted tactic will make the best player prevail. If you are thinking about getting it, get it. You won’t be disappointed. Just picked up a copy and played a 2 player game. I owned a copy of the original and it’s expansions. It was a breath of fresh air to play again. I will say that like the original the money for the company will be in the expansions. It plays easily and quickly and includes plenty to keep it different each game. Add a Review for "Wiz-War"